From Patricia: I used to ride the bus to high school and would sometimes rest my head against the window and imagine how my image would fit into a music video on VH1. I would imagine different songs playing behind what I considered my somewhat tragic image on the bus. Rocking along, hot and sticky in the Georgia heat, wishing I was home already, wishing I had a boyfriend or a better grade in Ms. Shelfer’s AP English class, contemplating good friends and gymnastic wins – day after day until college. I tried out Bon Jovi and Chicago songs, primarily. I am still rocking along day after day – highs and lows – making it through just fine. 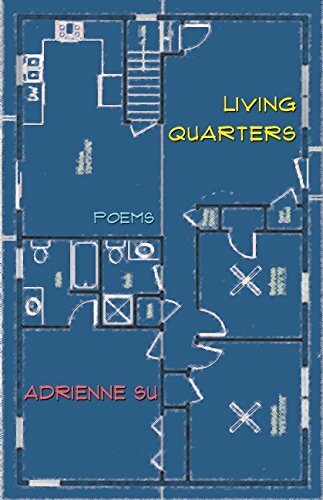 Though music videos no longer dominate my afternoons, perhaps I have finally found in Adrienne Su’s poems the perfect music for the music video of my life. Su has said that she prefers “the daily to the exotic” in terms of subject matter for her poems. In her newest collection, Living Quarters, Su again focuses on daily challenges and the ordinary cares of living life in the modern world. In an earlier collection, Having None of it, Su focused on balancing work and motherhood. In Living Quarters, she seems to be swatting at what I call “gnatbites” and the things that middle aged moms might think about while drinking a glass of wine alone. Oh, how she captures my feelings at this stage of life – as a mother, neighbor, homeowner and so many other roles that come with the passage of time and the natural rhythm of life. when was every chair last sat in? let hooks and racks assert new life. It’s impossible to quote individual poems and lines from poems by Su and convey the depth of her messages. They are deceivingly simple, yet moving when read as a whole. As I write that last line, I am thinking about the album Rumors by Fleetwood Mac and realizing, again, how poetry and musical works can be similar. I appreciate honest, straightforward works of art that make me think, and Su’s works have that effect on me and many others. Adrienne Su earned a BA from Harvard and went on to receive a MFA from the University of Virginia. She is the Poet-in-Residence at Dickinson College. She has won many awards, including a National Endowment for the Arts Fellowship and residencies at the Fine Arts Works Center and The Frost Place. I grew up and graduated from high school with Su, and thus saw her winning awards long before she became a professional poet. We were in high school in the 1980s, and even though Su is now known for drawing on her experiences as a second generation immigrant, enthusiastic gardener and single-mom, I see her as a fellow traveler sharing many of the same paths. For a review of Su’s work I especially enjoyed, see Allison Carruth’s http://www.publicbooks.org/multigenre/the-postindustrial-pastoral. Patricia Eastwood, senior corporate counsel at Caterpillar, recently finished serving as Chair of the Board of Nashville Ballet. She’s getting used to daughter Suzanne being away at college, but it can be hard. Younger daughter Dottie, husband Larry, and darling dogs Pluto and Lizzie keep things lively at home. For her most recent prior post at Bacon, click here. Here it comes: the first Bacon Symposium, this Friday, features 4 writers on the subject “Bob Dylan Should (Not?) Have Won the Nobel Prize.” The Symposium will be conveniently delivered to your in-box first thing Friday morning. Please send in a paragraph on your favorite book of 2016 for the Bacon Readers’ Top Picks post! (See Bacon Solicitation: deadline Sunday, December 11th). I truly appreciate the recommendations already sent and look forward to more! Perfect choice, Patricia. Who would’ve thought that you would have realized your pop star dream while working as a corporate lawyer! I may just post the video of you recording the Imagine Dragons cover, just for kicks. 🙂 Rocking the mike and the fringe jacket. Excellent post, and a great way to start the day. Thank you! You’ll have to talk to my agent before posting that video! Wouldn’t poetry read to a video and available 24/7 – sort of like a music video — be interesting? Thanks for reading.